The designers from Creative Cuts and More and Clear and Simple Stamps are joining forces for a Two Day "Perfect Pair" Blog Hop. Welcome to Day 1 of the Blog Hop, if you arrived from Kim's Blog you are in the right spot, if not you might want to start at the beginning so you don't miss any of the wonderful projects being shared today. 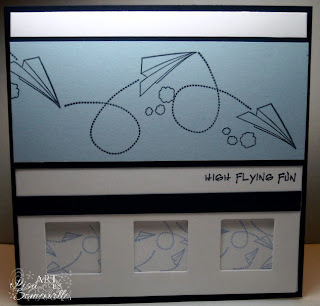 My projects use images from the Oh Boy set from Clear and Simple Stamps and the following Die Cuts from Creative Cuts and More: Tuck Top Cube Box in Baby Blue - SU Smooth and the Square Border Window Card in White. To create the Tuck Top Cube Boxes, I randomly stamped the images in Bashful Blue on the Blue Cute Die Cuts. The sentiment was repeatedly stamped in Bashful Blue on my White panels, then I sponged the edges, and added the other sentiments as shown in Navy. The main images are stamped in Navy on Ballet Blue card stock, cut out and popped up on dimensionals. These cute boxes would be fun to fill with treasures for a little ones birthday. 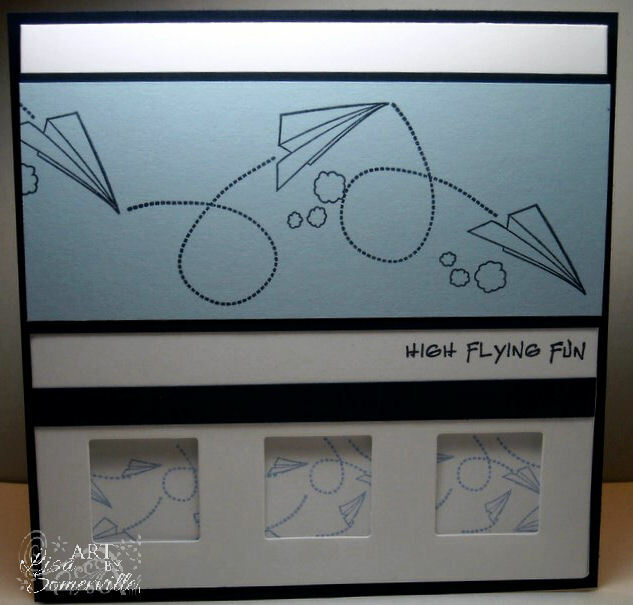 They High Flying fun uses the Airplane images and sentiment from Clear and Simple Stamps Oh Boy Set. Inside the card, the airplanes are stamped in Bashful Blue, so they show through the window openings. I added a Navy Panel behind the White Die Cut, a Navy strip just above the die cut window, and stamped the sentiment in Navy. The airplanes are stamped in Navy on Bashful Blue, layered on a Navy panel, then the base card as shown. Wouldn't this be a cut little boys birthday card? Thanks for stopping by, your next stop is the Nicki at the Clear and Simple Stamps Blog. Both Clear and Simple Stamps and Creative Cuts and More have fabulous prizes for the hop; to be entered into the prize drawing, Hoppers must comment on each blog along the hop in order to have a chance to win. Fabulous set of boxes and card! Love how you used the windows on the card. Oh my goodness! You worked wonders with those die-cuts! I love the cubes and your card is FAB! Ohhh these are so CUTE. I love that paper airplane card - my children leave a trail of paper airplanes across my house. Beautiful designs! these boxes are just fabulous! What perfect little treasures for a boy to get! The card is too too cute! You really rocked this HOP GF! Amazing boxes, and cute card too! Really fabulous samples. Totally love the little boxes. I love the little boxes and the card-you did a great job with the stamps & die cuts. It is amazing what you can do with a plain piece of cardboard! Adorable little boy boxes and card! Beautiful projects!! So cute Lisa! I love the boxes!! Your card is really awesome too! 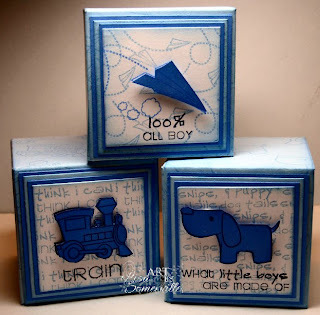 Oh, love the blues and inking on the blocks, they are adorable! Cute card too! Love the cubes!! So fun! Thanks for all your help Lisa! You've done a FABULOUS job showcasing the Oh Boy set - one of my FAVORITES - great projects! Love the bright blue, and the airplane, like we used to make. Love the boxes and your card. Love the color choice. Thanks for sharing. Very fun, adorable little boxes with matching card. I love your stamps! Adorable boxes and the card is so cute too. Wow! Lisa, those boxes are wonderful! I could see an entire alphabet of them on a shelf. How fun! The other project is just wonderful! It would made great framed art for the boys bedroom! Hi Lisa ~ You have truly captured the boy theme here...and I just love it!!! Thank you for your inspiration...my grandson would love this!!! adorable little blocks and such a fun whimsical card! Great projects--love the paper airplane. Such fun and unique ideas. Love how you used the die cuts for these projects. These would make adorable decorations for a little boy's room. Any young boy would love that card too. what a great idea for decor for a boys room. love the colors. tfs. Lisa these are sooo cute! !